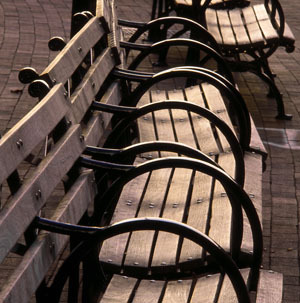 Municipal benches in Statehouse Square in downtown Hartford invite errand-goers to take a load off. It’s the kind of bench where you’d sit and feed a bag of popcorn to the pigeons. Or nod-off for a few minutes while waiting for your bus to carry you home to the suburbs. Wrought iron armrests guide you to exactly the amount of space you’re entitled to.